The Running Coach speaks with Jog Derbsyhire on Running Technique tips and explains to why you should be thinking about your technique, right from the first step of your first run. The Running Coach will be attending Bourne Sports for an introductory discussion on the science behind running biomechanics including how to improve technique; discussing common form faults and how to prevent recurring injury. Learn the skill of running & improve your technique on this 1/2 day course. Everything you need to know about the human biomechanics of running. How to change your technique and adopt a natural running style to increase efficiency and reduce the risk of common running injuries. Contact The Running Coach at chris.adams@therunning-coach.co.uk to enquire about a place, limited spaces available. The Running Coach will be meeting with members of Jog Derbyshire to talk about the skill in running, the natural technique and how/why to change your style. 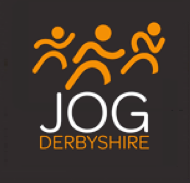 If you are a member of Jog Derbyshire and would like to attend, please e-mail Natalie to reserve your place on natalie@jogderbyshire.co.uk. 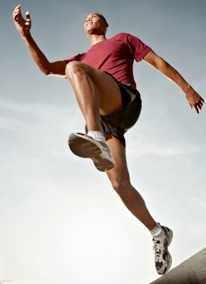 May'13 edition, includes 'Barefoot Running' article covering technique/efficient running, injury prevention and transitioning advice on adopting the new running style. Contributors included Chris Adams from The Running Coach, and Vivobarefoot's Lee Saxby. The Running Coach and Active Rehab Sports Physiotherapy recently enjoyed an evening with the members of North Derbyshire Running Club (NDRC), discussing Injury Prevention & Biomechanics of running. Club runners of varying abilities learned the importance of maintaining good biomechanical movement, strength and flexibility, the tell tale signs of a 'looming' injury, and the skill of running. Thank you to all that attended! The Running Coach is now delivering coaching services focused on 'Running Technique' and running development, operating from Sheepbridge Business Centre, Chesterfield, Derbyshire. 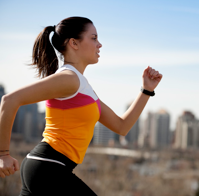 Contact us now if you wish to learn the skill and correct way of running to reduce injury and increase efficiency. The Running Coach is now delivering Running Technique training at Nuffield Health, Chesterfield. Please contact us to book a 1-2-1 individual coaching session, or enquire about club/group clinic. The running coach and Vivobarefoot enjoyed an evening with the students and athletes at Sport Sheffield educating on the skill of running. An evening of presentations with an informal question and answer session. We look forward to working with you all in the future and helping improve your running form. Thank you for attending and your involvement in the sessions. Chris & Mark. The Running Coach and Vivobarefoot will be attended The University of Sheffield on 2nd November, to educate students and athletes on Running Technique and Barefoot Running. Visit www.sportsheffield.com for further details.